The Full Moon of June is known as the “Mead Moon,” “Strawberry Moon,” “Rose Moon,” or “Thunder Moon.” It rises around sunset and sets around sunrise; this is the only night in the month when the Moon is in the sky all night long. The rest of the month, the Moon spends at least some time in the daytime sky. The Last Quarter Moon rises around 1:15 a.m. and sets around 1:15 p.m. It is most easily seen just after sunrise in the southern sky. The First Quarter Moon rises around 12:30 p.m. and sets around 1:15 a.m. It dominates the evening sky. 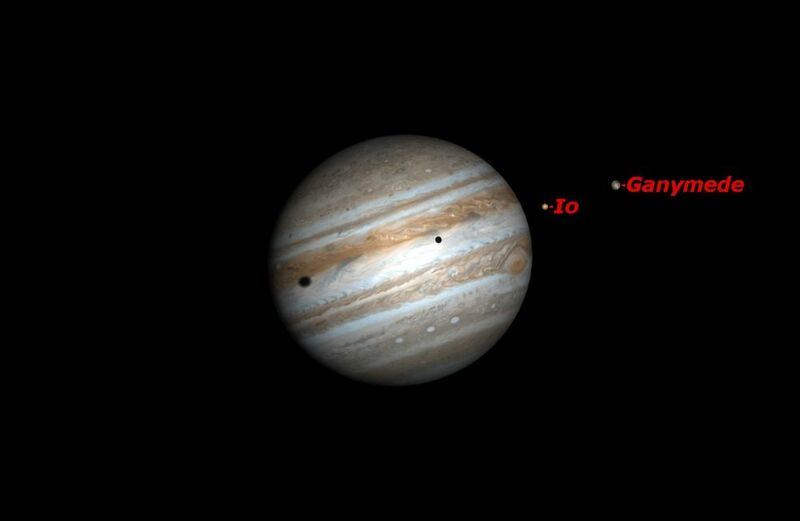 The shadows of Io and Ganymede will simultaneously fall on the face of of Jupiter. Venus reaches its greatest eastward distance from the sun, its orbit shown in white here. It is closing in on Jupiter. Pallas, the second largest asteroid, will be in opposition to the Sun. At magnitude 9.4, it will be located just south of Lambda Hercules, below the “keystone” of Hercules. The Moon will be close to Uranus just before sunrise. In southern Australia and the South Pacific Ocean, the Moon will actually occult Uranus, as seen here from Melbourne, Australia. As seen here from Sri Lanka, the Moon will occult the planet Mercury. Other parts of the world will see the thin crescent of Mercury very close to the thin crescent of the moon just before sunrise. 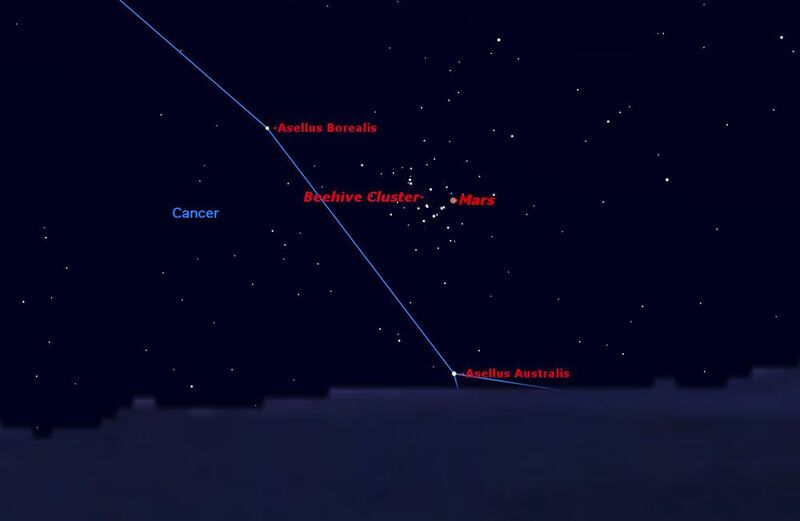 As seen here from eastern North America, the Moon will occult the bright red giant star Aldebaran. The sun reaches its most northern point, marking the middle of the astronomical summer season in the Northern Hemisphere, and winter in the Southern Hemisphere. The actual seasons tend to lag behind the astronomical seasons by about 6 weeks. 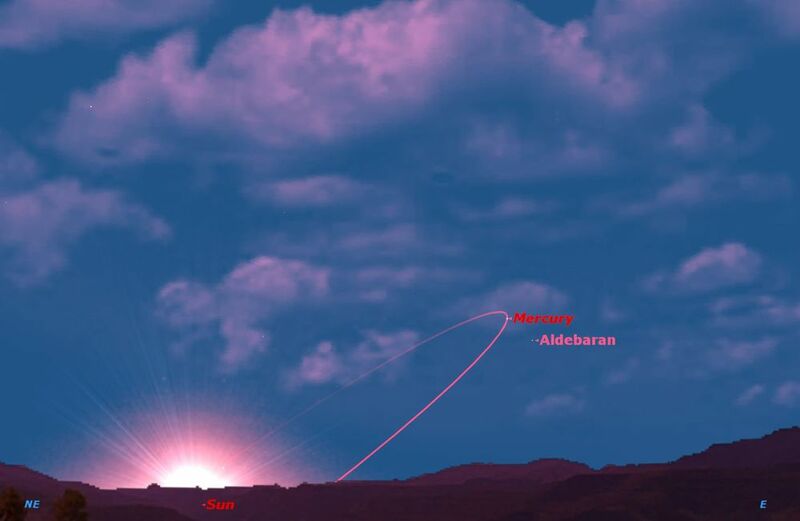 Mercury will be at its farthest from the sun, and close to the red giant star Aldebaran. 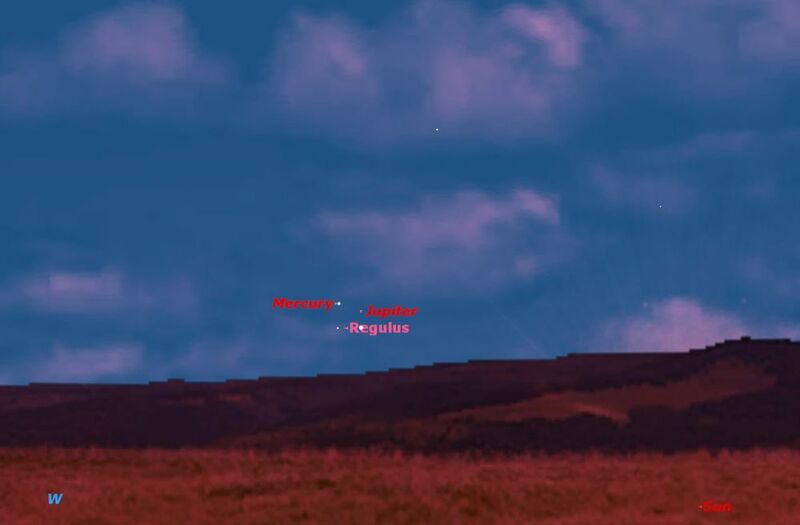 Venus and Jupiter will pass really close to each other, appearing within the same telescope field. Both will be 32 arc seconds in diameter, but Jupiter is much further away from both the Earth and the sun, so will be much fainter than Venus. Mercury is well placed in the eastern sky at dawn. It is better placed for observers in the Southern Hemisphere. Venus shines high in the western sky after sunset, reaching its greatest elongation from the sun on June 6. Mars is too close to the Sun to be visible. It will be in conjunction with the sun on June 14. Jupiter is low in the western evening sky all month, closing in on Venus. Saturn is just past opposition and shining brightly in Libra all night. Uranus is in the eastern morning sky in Pisces. Neptune rises after midnight in the constellation Aquarius. The Full Moon of May is known as the “Milk Moon,” “Flower Moon,” or “Corn Planting Moon.” It rises around sunset and sets around sunrise; this is the only night in the month when the Moon is in the sky all night long. The rest of the month, the Moon spends at least some time in the daytime sky. The Last Quarter Moon rises around 2 a.m. and sets around 1 p.m. It is most easily seen just after sunrise in the southern sky. The Moon will pass just south of the Uranus just before sunrise. Saturn will be in opposition to the Sun. Note how most of Saturn’s moons are in the same plane as the rings, except for Iapetus, whose orbit is tilted 8.3 degrees. At opposition, Iapetus is close to maximum elongation towards the west, while Tycho is close to maximum elongation towards the east.